Why would you drop a brand new expensive gadget? Well, curiosity but also entertainment for people on the Internet. You just have to pick an interesting victim, say a Samsung Galaxy Note 3. How does its faux leather back survive a collision with the pavement? Turns out, pretty well. The only thing that suffered was the camera housing that protrudes from the back, the camera lens, however, was intact. The bottom of the phablet did well too, only sustaining cosmetic damage. 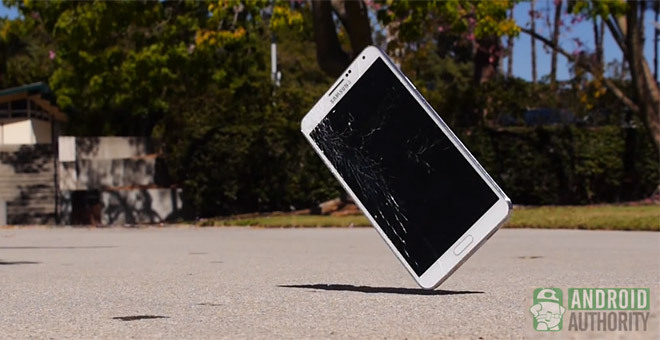 I’ll leave the result of the big test to the video – the fall-on-its-face drop that pits the Super AMOLED touchscreen against the rock hard ground. Well, consider that a warning – don’t drop the Galaxy Note 3 on its face or its big, beautiful screen will get pretty busted up. Thanks for the link, Rassa’a!